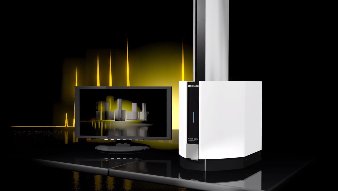 The MALDI-8020 is the latest benchtop, linear MALDI-TOF mass spectrometer delivering outstanding performance in a compact footprint, making it an ideal choice for today's increasingly demanding laboratories. Being a linear mode instrument the system is most ideal for quality control (QC) and profiling workflows. 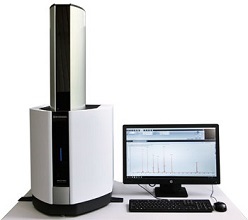 Peptides, proteins, polymers or oligonucleotides - the instrument is capable of delivering the performance required for regular QC applications. Besides the MALDI-8020 is a perfect choice for researchers working on MALDI based diagnostic methods. Compatible with the FlexiMass™ series of microscope slide format sample targets, the slides provide researchers with multiple options for disposable or reusable needs. The MALDI-8020 features wide-bore ion optics which minimizes the risk of source contamination over time and the TruClean™ UV laser-based source cleaning system ensures automated , rapid ( < 10 min) source cleaning in-situ without breaking vacuum. Operating under the control of MALDI Solutions™ software, the software features a centralized, secure Microsoft SQL database which can be used to store everything from sample lists and acquisition Parameter Sets to acquired MALDI data. The system is managed by an Administrator and customizable user profiles provide control over access to the database and operation of the instrument. Along with a full audit trail, the software provides the tools to help achieve 21 CFR part 11 regulatory compliance.